The head and thorax of Agrothereutes abbreviatus are black. The body is black with one or more red bands. The rear end has a white tip. 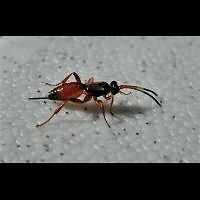 The antennae are remarkable, for they consist of three colours: a red beginning, then a few white segments and a black tip. Males possess common wings, but those of the females are extremely short, just reaching the end of the shield. Females are unable to fly. The size of the animal is very varying, depending on the victim eaten by the larvae. Males are 4 to 8 mm long, females 2 to 7 mm. The females run on the ground or between fallen leaves looking for a suitable host to put her egg on. The host is injected with poison, then the egg is deposited. 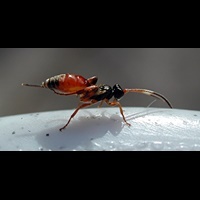 Contrary to the victims of many other parasitic wasps, the host dies very soon. The eggs are not deposited inside the host, but on top of it. The females often look for pupae to put the eggs on, but caterpillars and larvae are also used. The females are not picky at all. Many caterpillars and pupae of moths are used, such as the Bag Worm Moths, Case Bearers, Burnet Moths and Leafrolling Moths. However larvae of Saw Flies are used as well, such as the infamous Rose Sawfly. 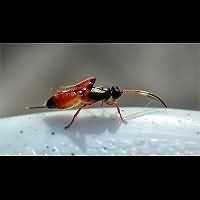 Adult animals are seen from May to October.
. Agrothereutes abbreviatus is widely spread: most of Europe and Asia. Yet it is never seen in large numbers. In Britain it is known to be scarce. In the Netherlands and Belgium it is rare. This page has last been modified on Thursday, September 27, 2018.